Lady Arkright was a childless Italian widow of a local gentleman with a farm neighboring Alethea’s father’s lands. She befriended Alethea and taught her to play the violin, which is a socially unacceptable instrument for women in England at the time. Lady Arkright learned to play the instrument, among many others, in her childhood in Italy. 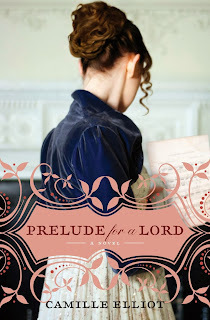 She loved Alethea like her own child and bequeathed her violin to her, unaware of its amazing history. 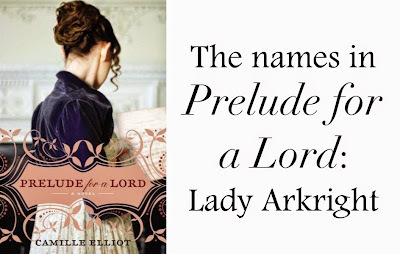 Lady Arkright has died by the time Prelude for a Lord opens. For a woman who didn’t have any page time in this book, I spent a lot of time building her backstory and trying to come up with her name. She was actually one of the most fun characters to write because she is the character who could have been. The composer Vivaldi had been employed from 1703 to 1715 and from 1723 to 1740 at the Ospedale della Pietà, a convent, orphanage, and music school in Venice. Some of the trained musicians left to advantageous marriages, which is how I got the idea for Calandra, Alethea’s friend, mentor, and mother-figure. I had Calandra being born in 1725 and sent to the Ospedale della Pietà, where she was trained in many musical instruments, including the violin. She would have been about fifteen years old when Vivaldi spent his last year at the Ospedale. When she was eighteen years old, she met and married Sir William Arkright, who was visiting in Venice. I chose Calandra because it means “skylark,” and it may have originally been a byname for someone with a good singing voice. Alethea still misses Lady Arkright and the music they would play together. Without Calandra and Lucy, Alethea feels very alone, avoided by the local women and misunderstood because of her scandalous instrument. Next, Alethea’s best friend and half-sister, Lucy.